Our key policy is to treat each client and patient on a client / patient specific need, listening to your concerns and answering your questions. 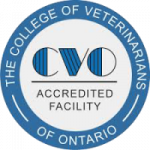 We operate under the rules and guidelines of the College of Veterinarians of Ontario (CVO) and the Ontario Veterinary Medical Association of Ontario (OVMA). We have included in this section our protocols and procedures for various treatments, vaccines, and surgeries. Each veterinarian has his/her own personal and ethical opinions, which will be discussed with you as a client, on an as needed basis. However, it is in our best interest to represent your educated wishes. We will endeavour, through face to face consultation, and via information available on our website, to inform you of all options available to you to keep your pet(s) healthy throughout their lives. We have access to specialist veterinary advice through the Veterinary Information Network, and we strive to keep current with all diagnostic procedures, medical guidelines and ethical procedures. We do have operating policies regarding appointments, cat boarding and reception etiquette, etc. We do have operating policies regarding appointments, cat boarding and reception etiquette, etc. Please see In This Section. We welcome your questions via email at welovepets@beechwoodah.com, but advise there may be a professional consult charge depending on the complexity of your question, and whether or not you are an active client with our clinic. This section has basic protocols followed by Beechwood Animal Hospital. If you have any questions regarding bringing your pet to our clinic, please call us at 613-748-9820 between 7:00 a.m. and 7:00 p.m. Monday to Friday, and 8:30 a.m. and 3:00 p.m. Saturdays. Our staff will be more than happy to answer your questions.